This summer passed so quickly for my husband and I that our heads are still spinning. We tried to front-load all our travels so that we’d have a nice, quiet August. But often even the best plans are laid to waste. Then again, when your friends have a choice between crashing at your house for a week or spending tons of money at an overpriced hotel, what choice is there really? And who actually wants to paint their master bathroom? Seriously, I don’t feel like crawling under that countertop right now. The good news is, even though things were hectic and never felt like they settled down, we had a ton of fun this summer. And at the end of the day, that’s what really matters. It’s been awhile since I talked about our adventures, so here are some of the highlights! Our First Official Wine Tour! We’ve lived in wine country for four years now. True, I’ve never been much of a wine drinker. I don’t really have the taste for it. But living in a place that produces a lot of wine means receiving many bottled gifts. And tasting those gifts certainly helps open the door. We’ve done our fair share of informal wine tastings before, driving around with friends to various locations to see what they have on tap for the day. But this time we went all out and paid for someone to drive us around. So this time I made a vow that I would drink every wine poured for me, instead of sipping it and handing it off to my husband (which is what usually happens). I Finally got to see Wicked! I’m a huge fan of Broadway musicals though, sadly, I haven’t seen many. I count myself lucky that my high school trips to New York involved shows like Jekyll and Hyde or Les Misérables. When my husband took a trip to New York last year with his students they got to see – brace yourself – Spongebob Squarepants on Broadway. 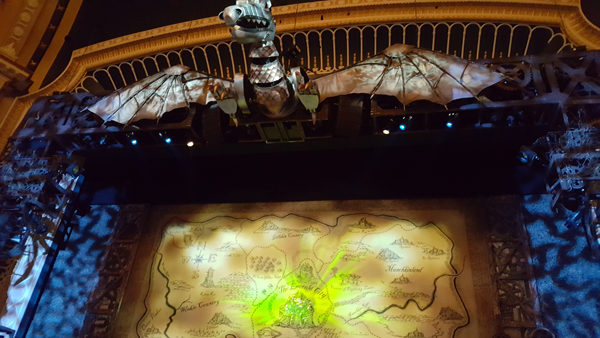 Top of my to-see list for a long time has been Wicked. First because it’s based on the Wizard of Oz lore, and I’m a huge Wizard of Oz lore nerd. Every time there’s a book or TV series or movie that plays with that lore, I’m drawn to it. I’ve seen some great ones (see Tin Man, the TV series) and some horrible ones (which shall go unnamed). And Wicked came highly recommended by not one but TWO of my big theater-frequenting friends. It was, in a word, amazing. Even having heard some of the music before seeing the show, it blew me away. I wasn’t prepared for the visual effects, the fantastic play on the lighting. The tears. Oh my goodness, I’m so glad I had tissues in my purse for Act Two! Even my husband seemed to like it, and he’s not a huge fan of musicals, so that’s a fine endorsement. 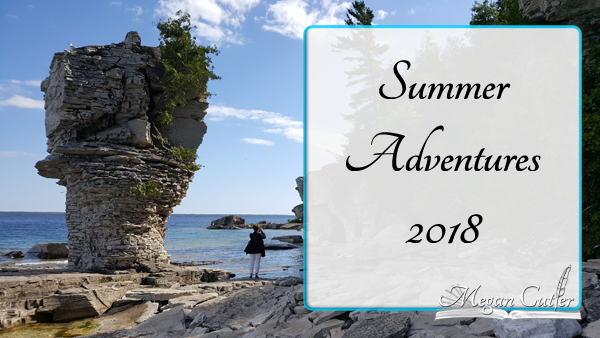 While we out east visiting family, we took a small day cruise to Flowerpot Island to see some interesting land formations known as flowerpots (which are a type of sea stack). They were formed over many thousands of years while the water of the bay eroded the soft rocks on the outer portions of the island, leaving a series of top-heavy stacks in the shape of flowerpots. Seeing pictures of such rock formations is one thing, but they’re strikingly impressive close up. In fact, the entire island is pretty interesting. There’s very little soil, yet it grows dense with plant life. That’s because the algae sludge that once covered the rock was so thick with nutrients that trees and other plant life were able to grow right on top of the rocks. And indeed, as you explore the island, you can find several places where small trees rise directly from the rocks near the edges of the island. 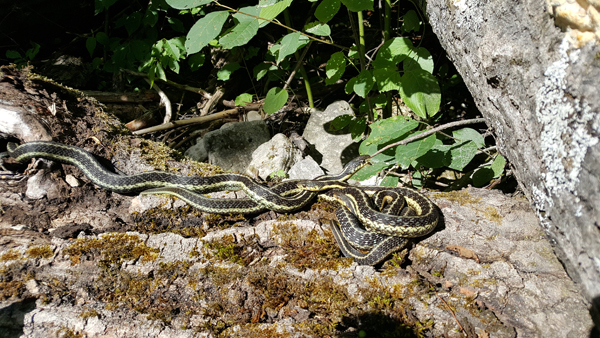 We even found a family of snakes sunning themselves on a log after an afternoon snack. One of the coolest things about the visit was taking a glass-bottom boat over to the island. On the way, we were able to see series of shipwrecks in the bay, one of which is fantastically well-preserved (possibly because the crew were forced to sink it on purpose). Last, but certainly not least, we took a drive to visit family in Calgary. It was our first time driving in that direction and it certainly provided a spectacular view, especially while we moved through the Canadian Rockies. The main point of the trip was to surprise my husband’s aunt for her sixtieth birthday, and the look on her face made all the hours in the car worthwhile. While we were visiting, her family showed us around Calgary, including a trip to the science center and one of their favorite restaurants. We almost ended up in Calgary a few years ago when my husband was job hunting from England, but it didn’t work out. Now that we’ve seen the city, I can safely say that we would have enjoyed living there. Though it’s both sprawling and rapidly growing, their approach to city expansion works really well. Each new section seems to be its own little community with access to the city’s transit system. Possibly the most interesting part of the trip was a small taste of Calgary’s unusual weather. They seem to have that rain at the same time every day in the summer weather that’s typical of places like Florida. But they also just seem to get random lighting storms. The first time we saw a random lightning strike in the car, we were both quite startled. That, and driving through a random hails storm – which luckily only lasted a few minutes and didn’t crack our brand new windshield. But my biggest lesson this summer is that I’ve become disciplined enough to write even when my schedule isn’t accommodating. I posted some of my highest word counts in July and August, despite the amount of travel and visiting we did. Though I am hoping for a quieter summer next year! This trip sounds like it was wonderful. I’m glad you had such a good time. For all that the summer was hectic, it was worth it for all the fun we got to have with family and friends. I’d really love to go back to the flower pot island again sometime and see more of it!